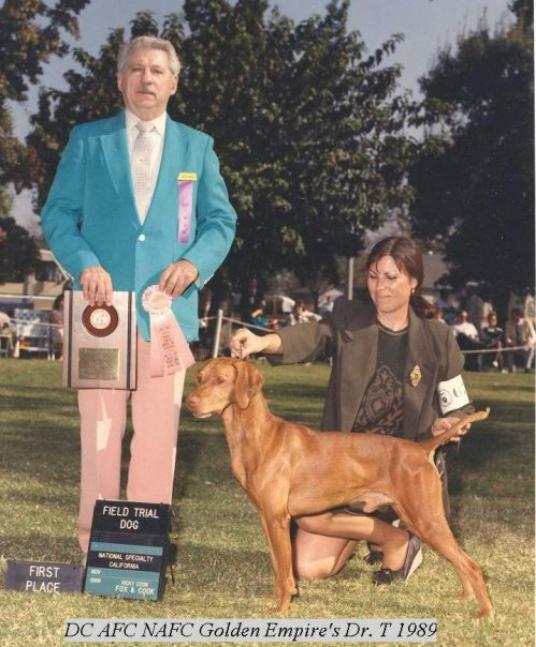 Top Producing Sire Of All Time - "Field Champions"
Registry Of Merit (#27 ROM) and VCA Hall Of Fame (HOF) - 1998. VCA HALL OF FAME - 1998! 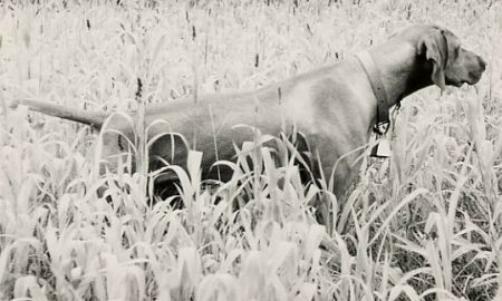 TOP PRODUCING SIRE OF ALL TIME "FIELD CHAMPIONS" - 2016! RECORD HOLDER - EIGHT SIRED DUAL CHAMPIONS (DC) - 2016! 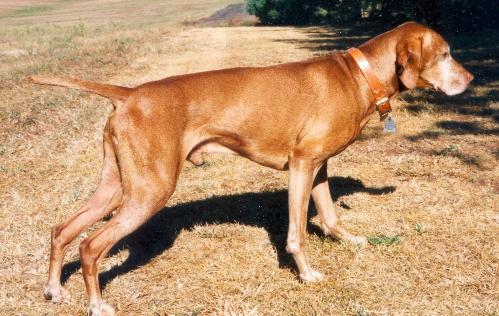 is the oldest living Vizsla on record, living to be 20 1/2 years old. 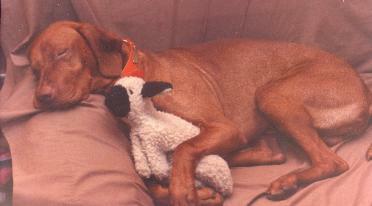 Source: Vizsla Database & Rita Mather. 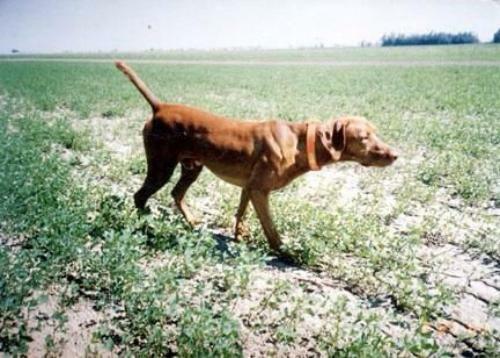 FIRST VIZSLA on record to LIVE 20 1/2 YEARS 1982-2002! TOP PRODUCING SIRE OF ALL TIME- 2003! VCA HALL OF FAME - 2006! 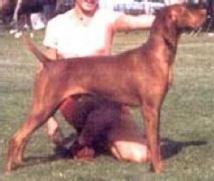 Fame (HOF) - 1979. She was a Proven Producer. Offspring: FC AFC Behi Csecse Csiny ROM & FC AFC Behi's Piri Csiny. (VC), Registry Of Merit (ROM), Hall Of Fame (HOF)! 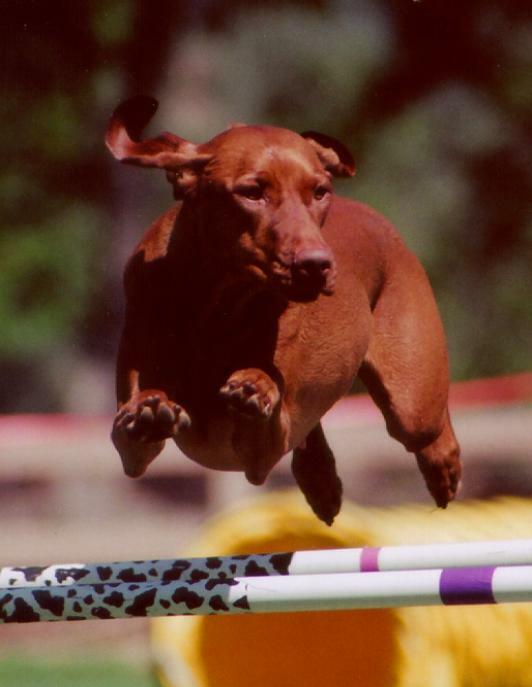 National Field events. 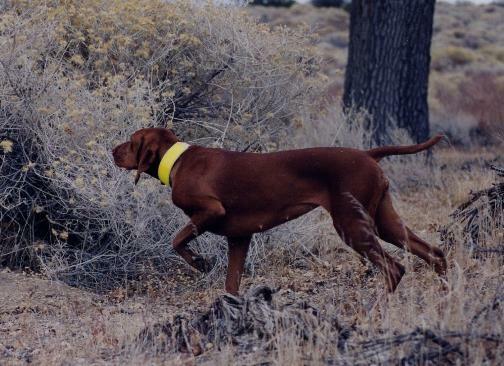 He always ran big, hunted hard and handled kindly. 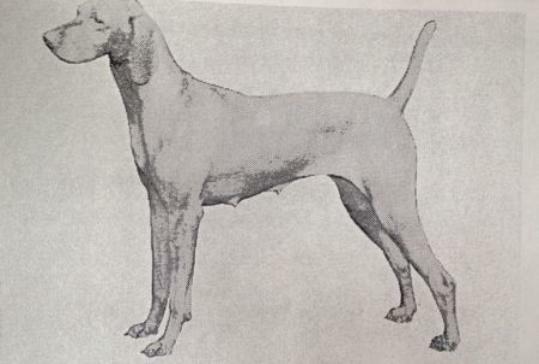 name appears in the pedigrees of many outstanding field and show dogs. 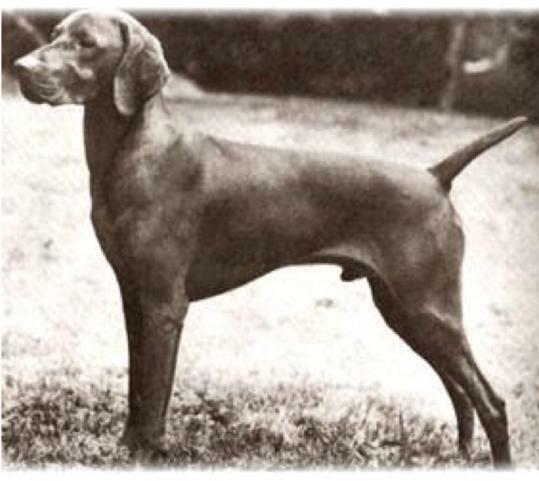 Champion in the organizations' 116-year existence - 2000). 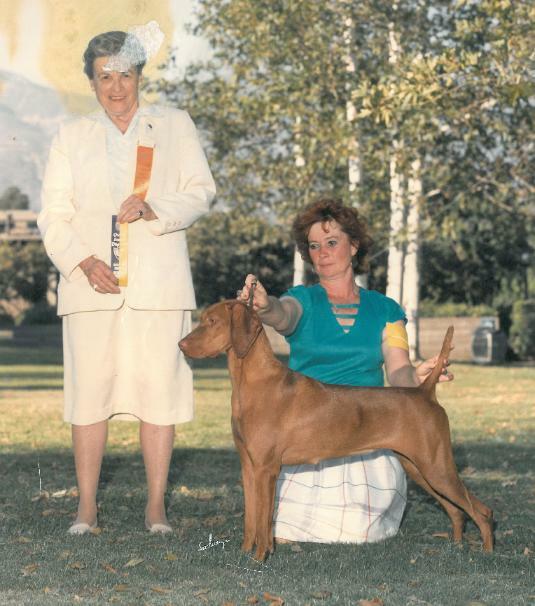 SIRE: Am/Can CH Valhi's Stick to Your Guns CD, VC, HOF "Deacon"
DAM: CH Oakleaf's Rebel Rouser Image ROM "Ria"
Hall Of Fame (HOF) - 1999. 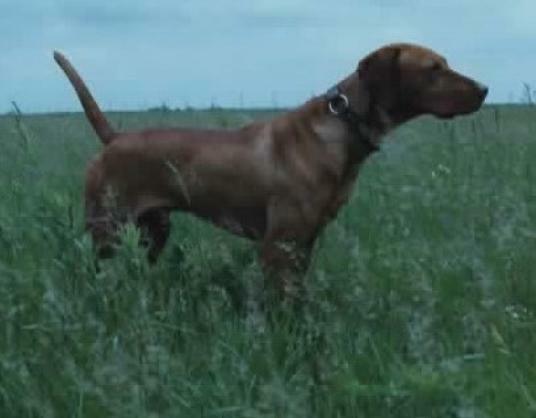 Doctor T LOVED to hunt and did it with much style and grace. 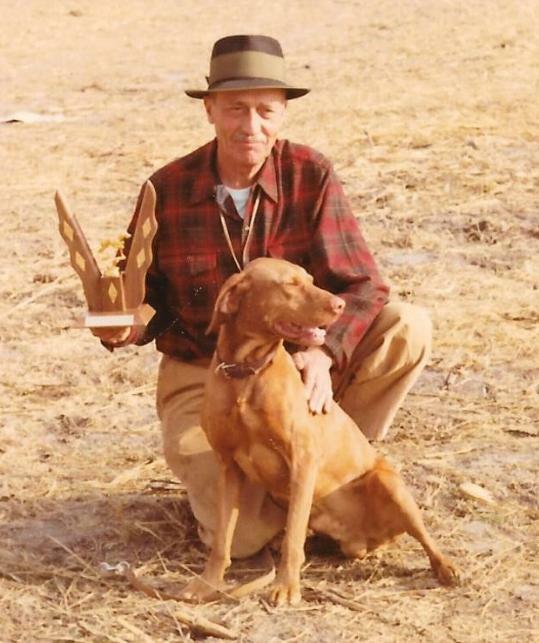 Champion and the 1984 National Derby winner. VCA HALL OF FAME - 1999! VCA HALL OF FAME - 2000! VCA Hall Of Frame (HOF) - 1994. News Flash! 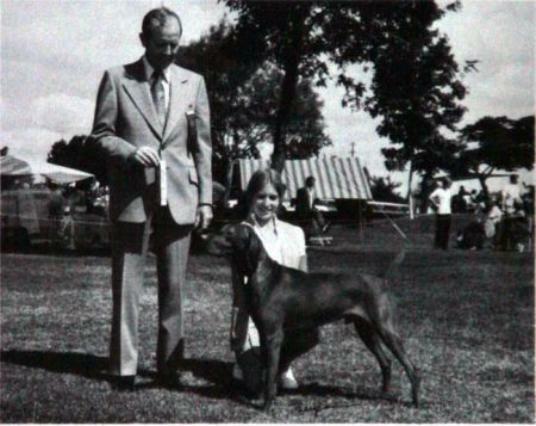 Click here for a COMPLETE LIST of the HALL OF FAME, courtesy of VCA, Jamie Walton. 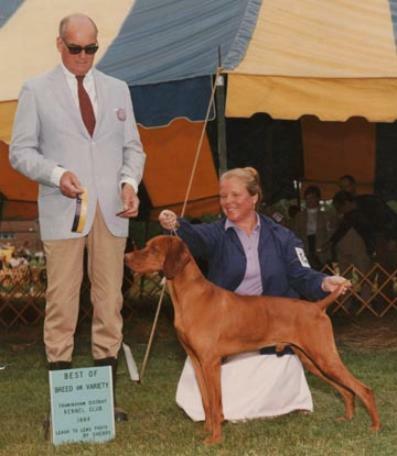 FIRST VIZSLA to earn a DUAL CHAMPION (DC) TITLE - 1965! 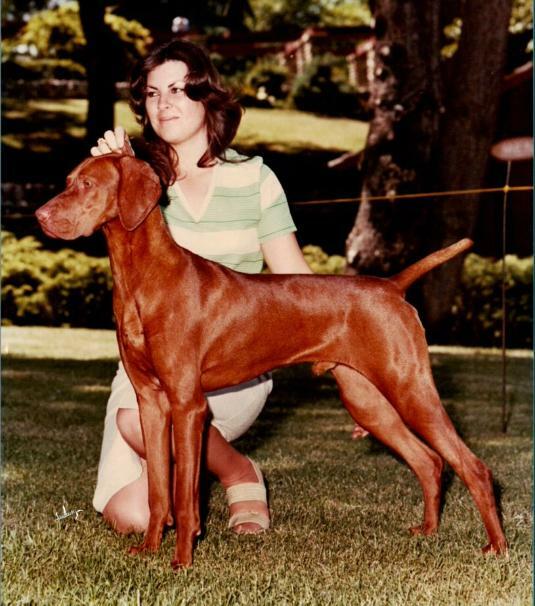 FIRST VIZSLA to be honored in the VCA HALL OF FAME - 1967! 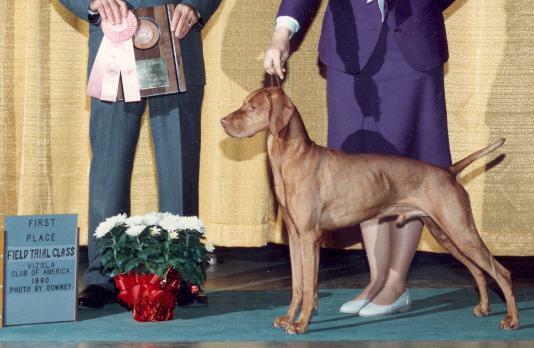 and First Vizsla to be honored in the VCA Hall Of Fame - 1967. 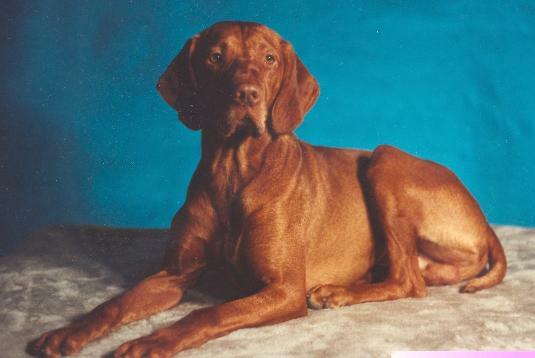 SIRE: CH Hunor / Heniu of Gardenville "Huni"
VCA HALL OF FAME - 2001! TOP PRODUCING DAM OF ALL TIME - 21 CHAMPIONS (22 titled progeny)! 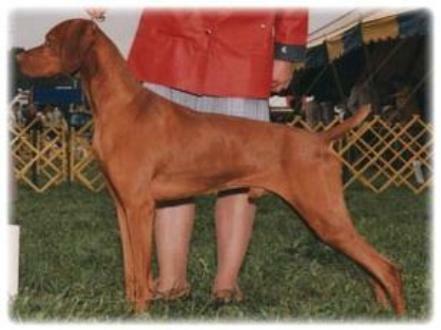 & Great Great Granddaughter Ice - GCH CH Kizmar Ice Potion RN, JH, AX, OAJ, ROM, 3rd Top Producing Dam! 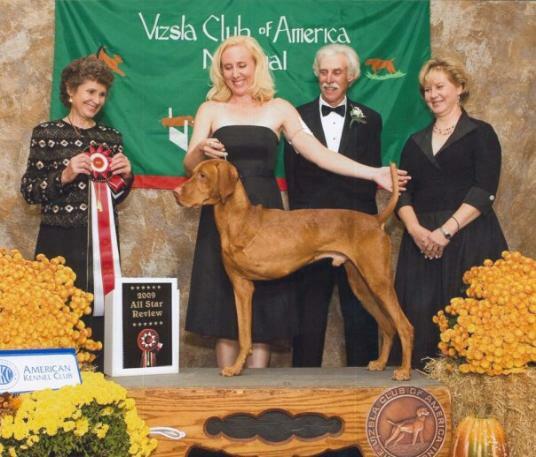 (NBISS) and Multiple Best In Specialty Show (MBISS). VCA Hall Of Fame (HOF) - 2016! 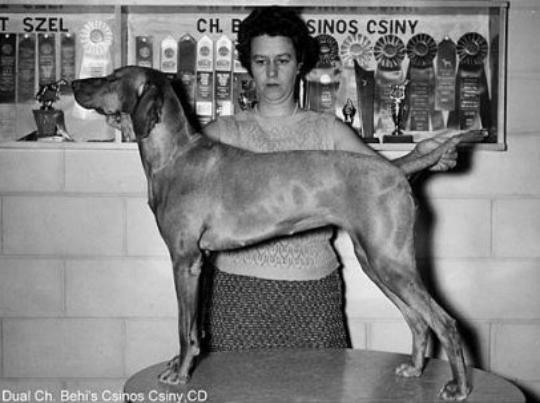 A Top Producing Dam in History - 10 Champions (10 titled progeny)! 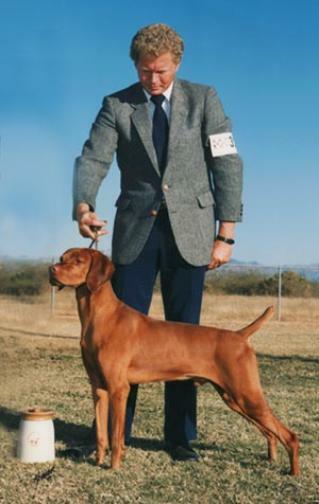 SIRE: BISS CH Rivercity's Quenton Cassidy MH, ROM "Cassidy"
DAM: CH MACH2 Russet Leather Anasazi JH, MXC, MJG "Necka"
VCA HALL OF FAME - 2016! Top Producing Dam Of All Time! 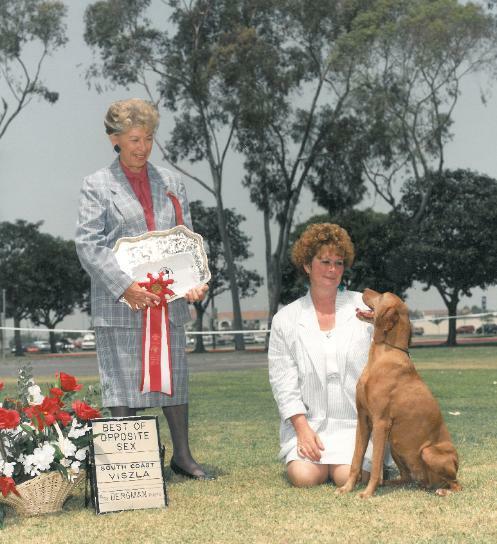 Registry Of Merit (ROM) & VCA Hall Of Fame (HOF) - 2001. OAJ, ROM - 3rd Top Producing Dam! 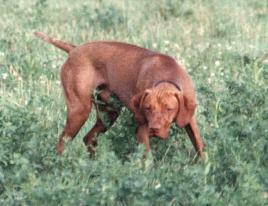 SIRE: BISS CH Rotkopf's Super Charger CD, JH, VC, HOF "Charger"
KENNEL NAME: LEGACY VIZSLAS - AKC REG'D. 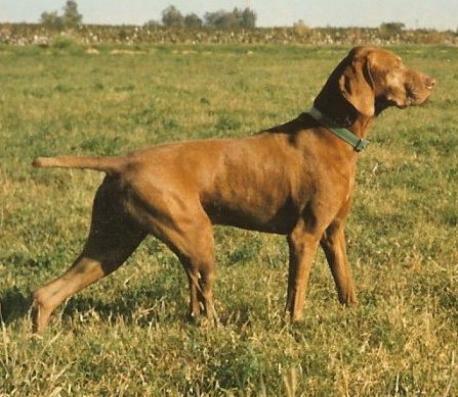 Legacy Vizslas....our original stock all had Sagi in their names. 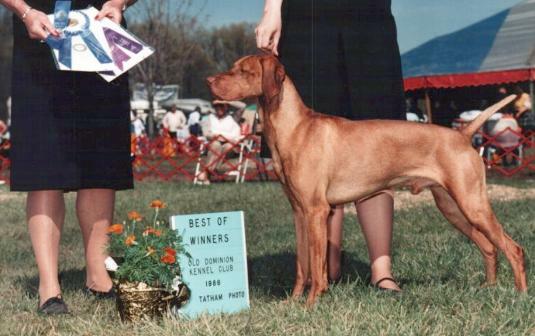 Quintuple Champion in the organizations' 116-year existence - 2000.
flew all over the country to special AKC events to interact with the public. was honored in the prestigious Hall Of Fame - 2007 (HOF). 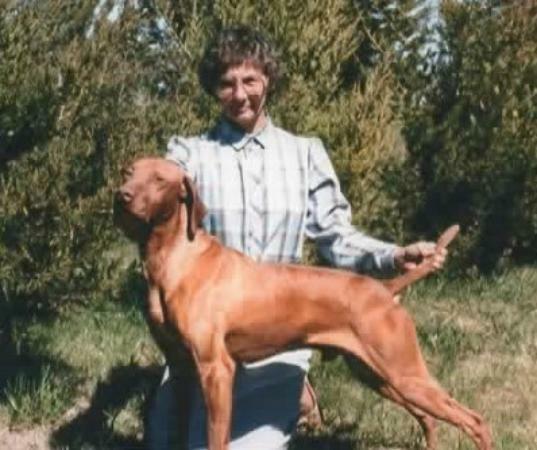 MOST TITLED DOG (All Breed) in AKC HISTORY - 2000! 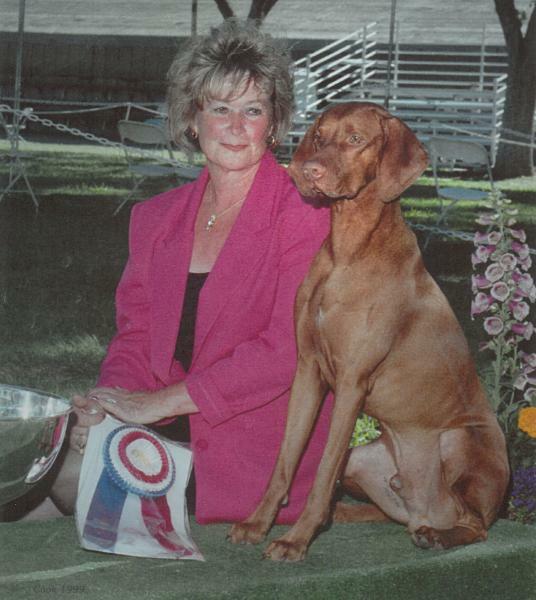 AKC's FIRST QUINTUPLE CHAMPION in the organizations' 116-year existence - 2000! VCA HALL OF FAME - 2007! and VCA Hall Of Fame - 1987. 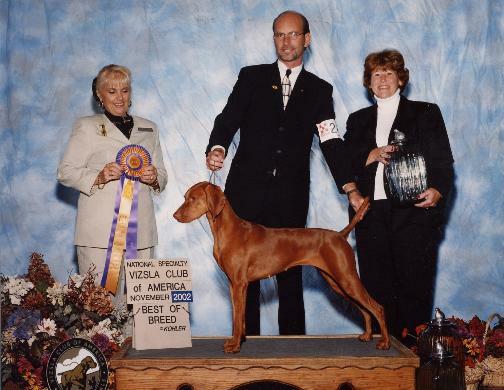 14xBIS - TOP WINNING BREEDER/OWNER/HANDLED VIZSLA OF ALL TIME - 2007! 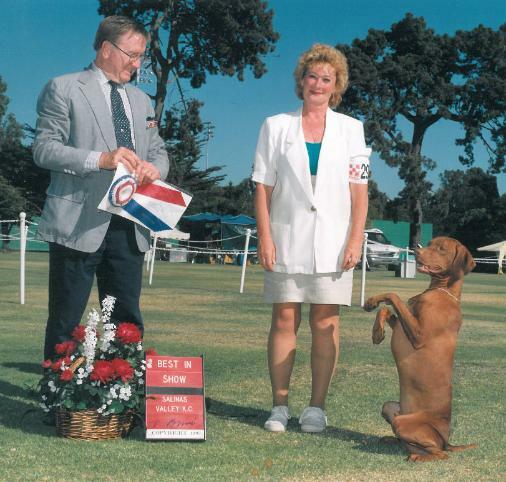 BEST OF OPPOSITE (BOS) - 1999 and BEST OF BREED (BOB) - 2001 & 2003! VCA HALL OF FAME - 2018! 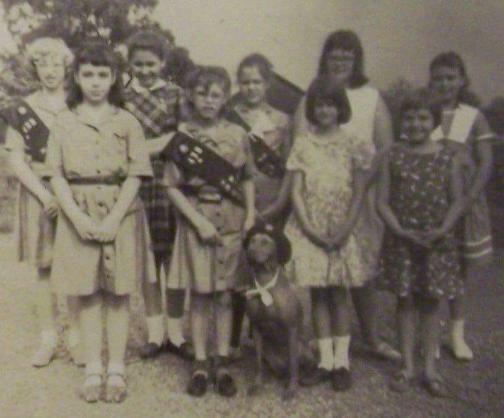 confirmed by Mary Chelton, VCA Historian. 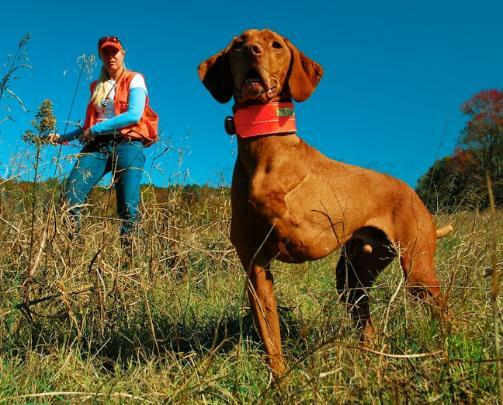 a Master Hunter and a Rally Excellent and Utility Obedience dog. 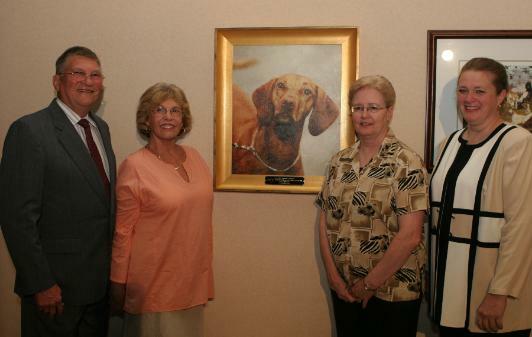 nominated by VCA, AKC Humane Fund Award for Canine Excellence (ACE) Exemplary Companion - 2013! 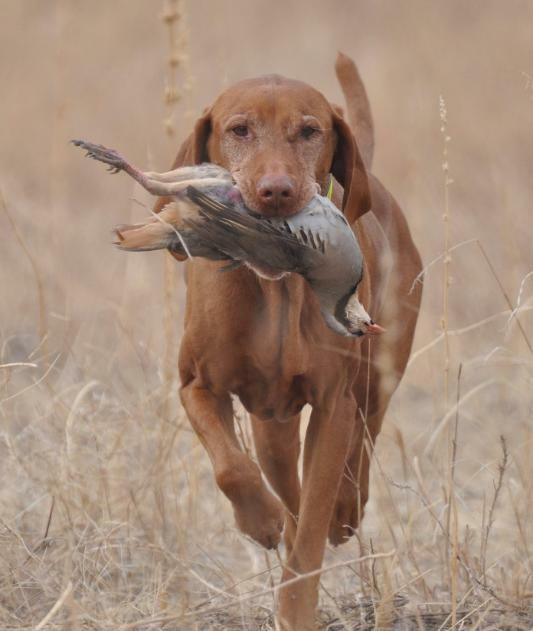 FIRST TRIPOD VIZSLA to earn his AKC MASTER HUNTER - 2009! 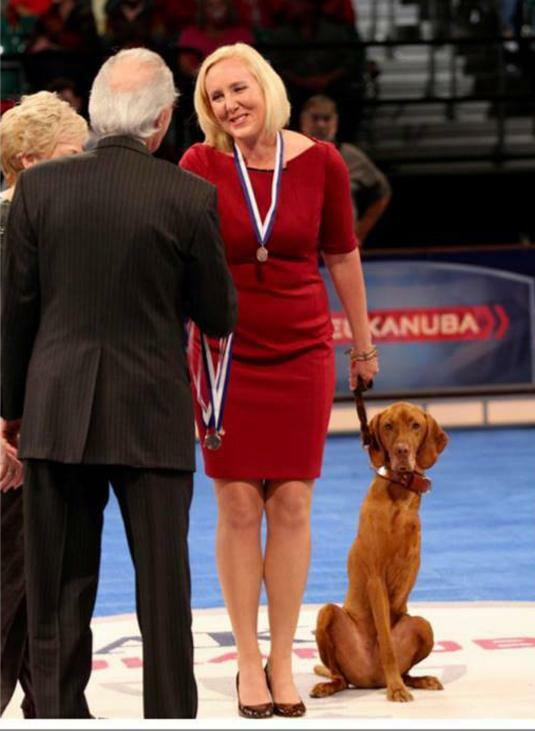 and I am proud to have been chosen to make this journey with him. 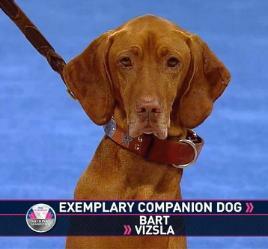 Only Tripod Vizsla in History to participate in the All Star Review! 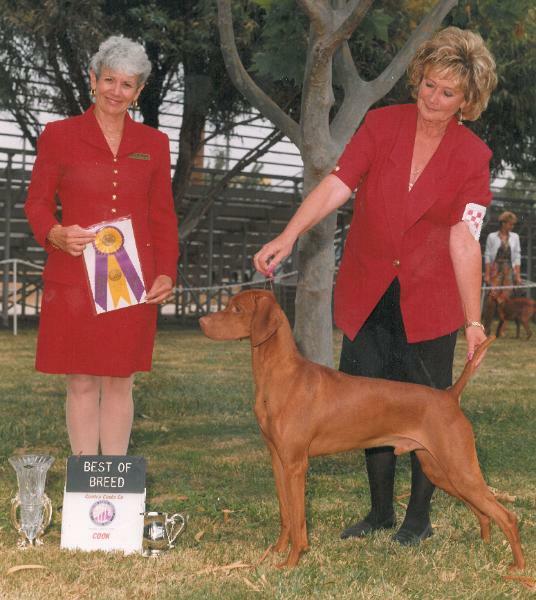 Bart stars in the Breed booth - 2013 they win 1st Place! 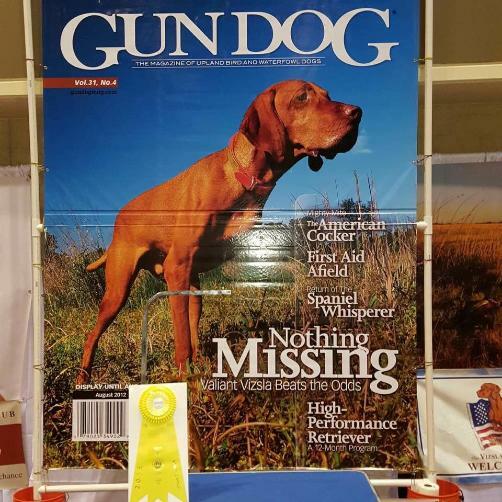 Breed booth - 2016 they win 3rd Place!